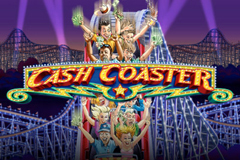 Basing a Poker machine around the topic of roller coasters may bring to mind the potential ups and downs of losing or winning spins, but in the case of Cash Coaster, from IGT, it works pretty well. It’s an old-style pokie that has traditional fairground related symbols and a retro wooden coaster behind the 5 reels, but it also has some bonus features that bring it right up to date, such as free spins with extra wild symbols. Players can stake from just 0.30 per spin, which activates all of the 30 paylines, or adjust their bets upwards to a maximum of 60.00, winning a prize whenever 3, 4 or 5 of the same symbol type stop across any line, on sequential reels running from either side. The fact that lines pay from left to right and right to left is an unusual feature that gives players twice the chance to land a win with each spin. The fairground theme runs all the way through this game, with the bright flashing lights that make these places stand out being featured in the title, around the reels and even extending to the control buttons. Many of the symbols are directly related to it as well, with various unhealthy snacks that would be seen around a fairground making up the smaller wins. A pretzel and a chocolate-covered apple will each pay 5x, 15x or 75x the line bet when they land on 3, 4 or 5 reels, while going up in value we see an ice-cream, candy floss, popcorn and a cornet that’s worth 10x, 25x or 150x. The higher value symbols are all different variations on the number 7, ranging from a yellow that pays 15x, 30x or 200x, through purple and green 7’s and then blue and red that are lit up, fairground style. The red pays 50x, 150x or the game jackpot of 500x when it lands across a payline, although as a consolation prize, landing any combination of 7’s across the reels will be worth a payout of 40x. A brightly lit, multi-coloured wild symbol will substitute for all others except the Free Spin symbol and help players to see extra winning combinations created. At any time, the outermost reels can become fully wild and as wins run from left to right and right to left, this can be an easy way to land a few payouts in a single spin. These reels will also be fully wild during the bonus game, which is triggered by landing 3 or more Free Spin ticket symbols. Before the spins begin however, players will be paid 30x the line bet and then they will be taken to 3 ticket booths and need to select one of them to see how many games will then play out. They will be awarded 4, 5 or 6 free spins and while this isn’t many, the fact that reels 1 and 5 are wild means that they should still see a few winning lines during the bonus games. If 3 or more purple free spins tickets turn up before the current games have ended, a further 4, 5 or 6 will be added to the end of any still left to play out, plus there’s the 30x the line bet awarded as well. This is certainly a colourful pokie and with the animations of flashing lights plastered all around the game, it brings the fairground theme to life in a dazzling and eye-catching way. It works slightly differently to most games however, particularly in the way that winning lines can run from the left side of the reels, which is normal, and the right side, which isn’t. It effectively doubles the number of paylines, as a 30-line game that only pays left to right has only 30 places that a combination can start from, but by making it pay from the right as well, we have 60 places to start a line. Bonus features are slightly unusual as well, as reels 1 and 5 turning wild at random, and staying wild throughout the free spins round, should be enough to bring in some decent wins and more than likely a couple at a time. If there’s anything to criticise about this game it’s the choice of symbols, as different snacks are not the most exciting things to look at, and the numerous 7’s that populate the game may be colourful, but nothing special either. That’s a minor complaint though, as the important thing is how Cash Coaster plays and what prizes are likely to be won during the game, and in this respect, it’s a pretty good all-rounder.